Boarding the flight was a bit of a rush because there was no calls made in the lounge and we did not realize there was still passport control before boarding. Fortunately the passport control was empty and the ground crew was waiting for us across the passport control point. I remember thinking aloud that if it weren’t for the fact we were seated in First Class, the plane might have left a long time ago! 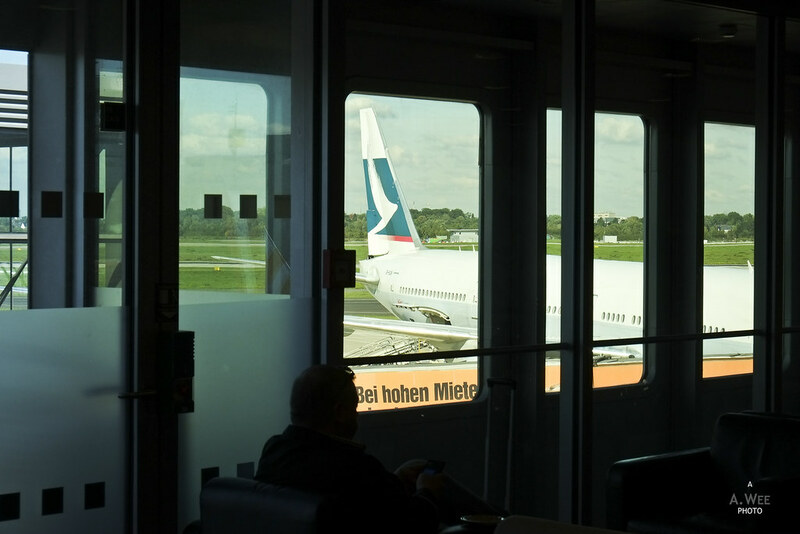 As we were the last passengers to enter the cabin, we were a bit flustered and the two cabin crew serving the First Class cabin was there to assist us. It was still an empty cabin and I wanted my Dad to be seated up front on 1K when the attendant said there was someone seated there without realizing I was seated there. After we got settled down, jackets placed in the closet and luggage stowed underneath the ottoman, hot towels were provided for us to freshen up. 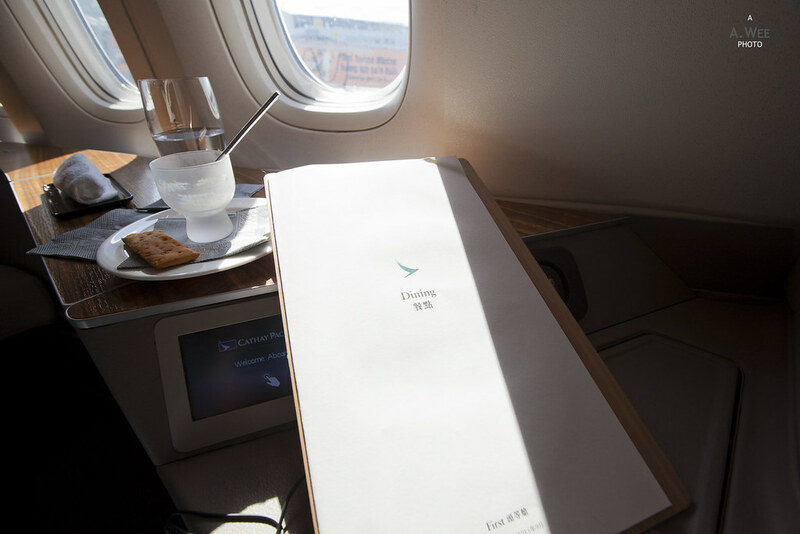 Cathay Pacific’s First Class has been refreshed since I was last onboard, and it was a nice update to an already stellar product. 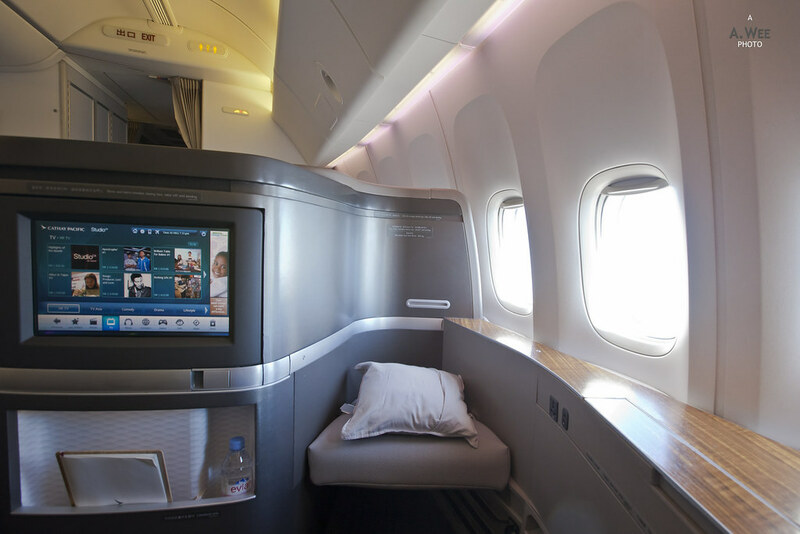 The usual fresh orchids are still there and there was the touch screen seat controls on the armrest. 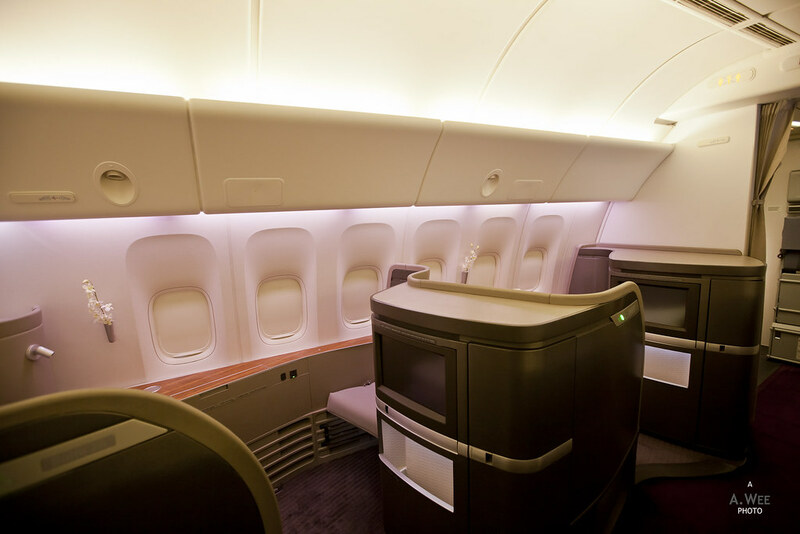 Otherwise the colours of the cabin are slightly darker to give a more refined ambience. The crew then got busy to serving us with the welcome beverage with champagne on offer. 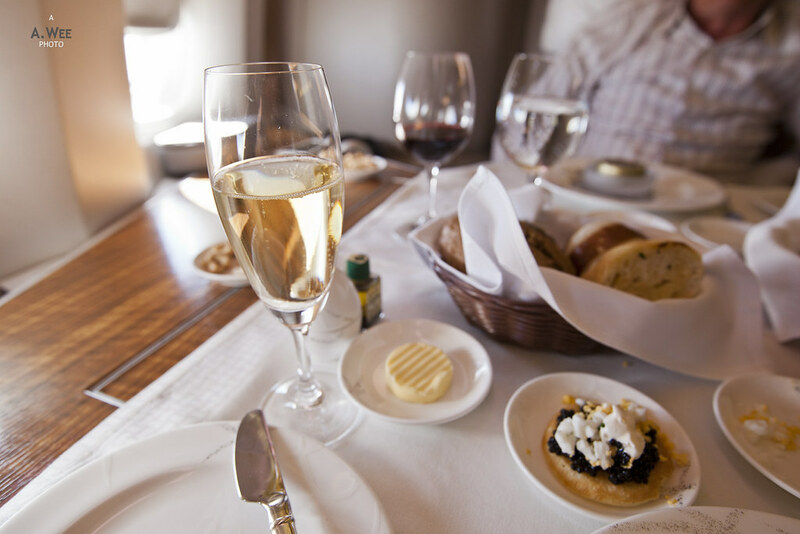 Since it was going to take-off, I just had a glass of water first and decided to leave the champagne for after take-off. Purser Sue who was from Malaysia came over to distribute pyjamas and the amenity kit. I was asked for a choice of medium or small, and I went with medium as I think small might be too short in terms of sleeve length for me. For the amenity kit I asked for the female amenity kit which I intend to give to my Mum, and since my Dad would have the male amenity kit anyway. On the ottoman, there was also a pillow. 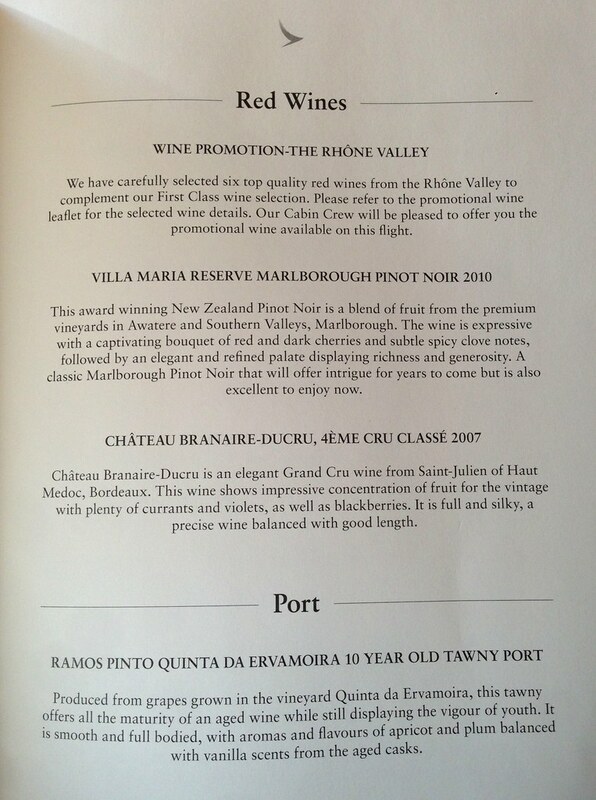 Turns out there was only 2 of us in First Class which adds to a great experience since there was 2 crews serving us. That also meant a more attentive service with meal orders taken before we take-off. During this time the Captain also announced a flight time of 11 hours. Short queue for take off was another good part of departing from the smaller airport but it does make for a shorter experience onboard this nice cabin! 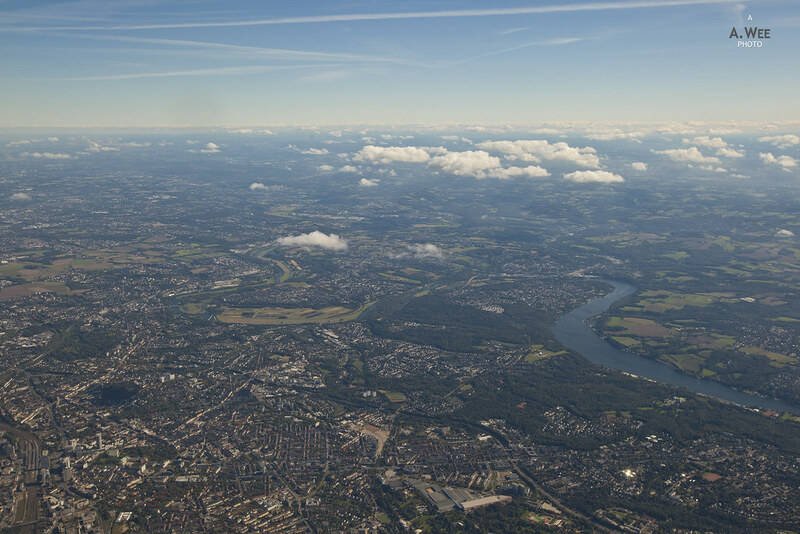 It was a clear weather over Düsseldorf this afternoon and as we took off, we passed by the nearby town of Essen and the view was magnificent throughout our climb towards cruising altitude. After reaching cruising altitude, the inflight service manager (ISM) personally came over to greet my Dad and myself by welcoming us onboard the flight. With the warm welcome, what followed was a ramekin of warm cashews with a beverage of choice served before the proper meal service. Since it was a nice afternoon flight, I opted for the Hong Kong style milk tea which I liked but the rendition provided was a bit too bland. Shortly after the crew came over and asked when we wanted to dine. 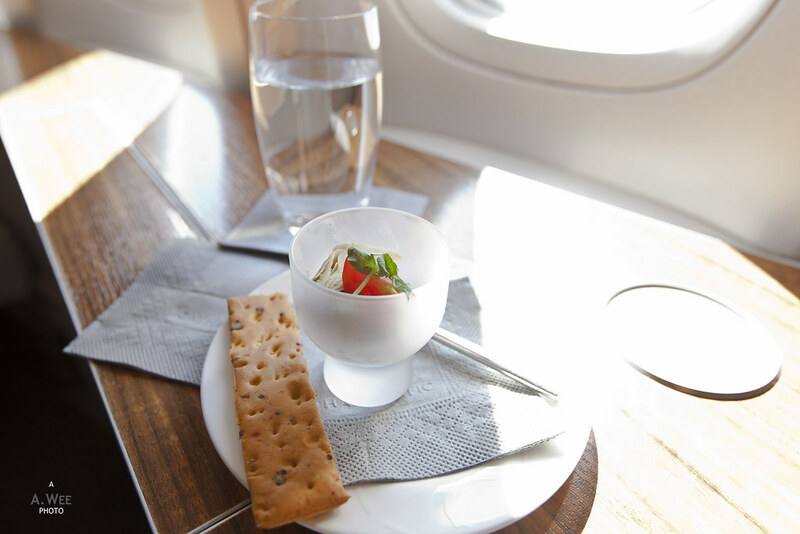 Being in First Class and with an empty cabin made it easy to provide this service of dining whenever it pleases you! 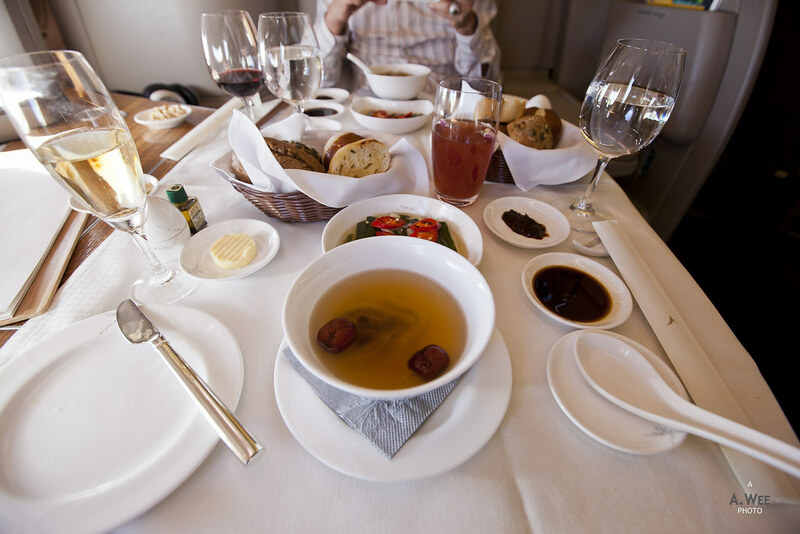 Since it is common in Asian culture for families to dine together, I made the call for me and my Dad to dine in his cabin, and this was another pleasure of being in First Class! 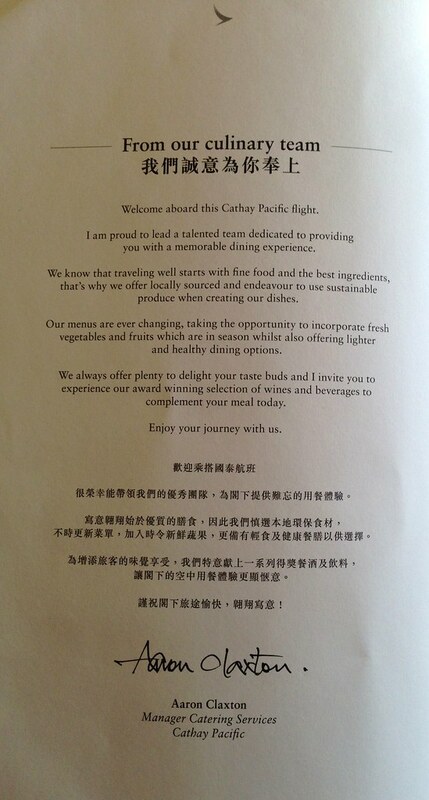 After picking the Chinese meal for both of us, Sue asked if we would like the caviar service as well. 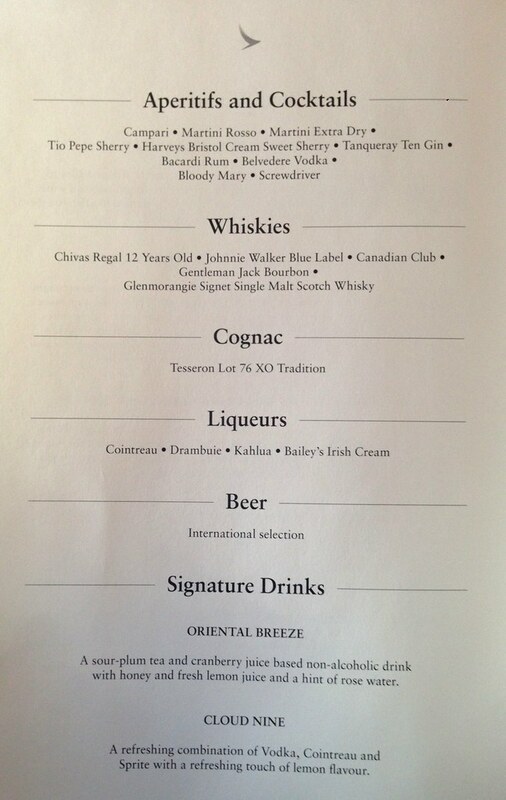 For sure, since that is always one thing to look forward to while in First Class. 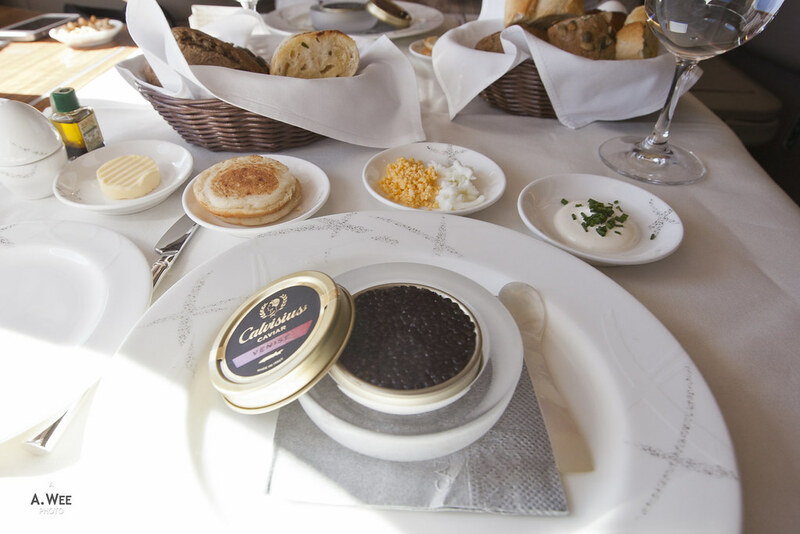 As expected the caviar service was great with all the requisites! 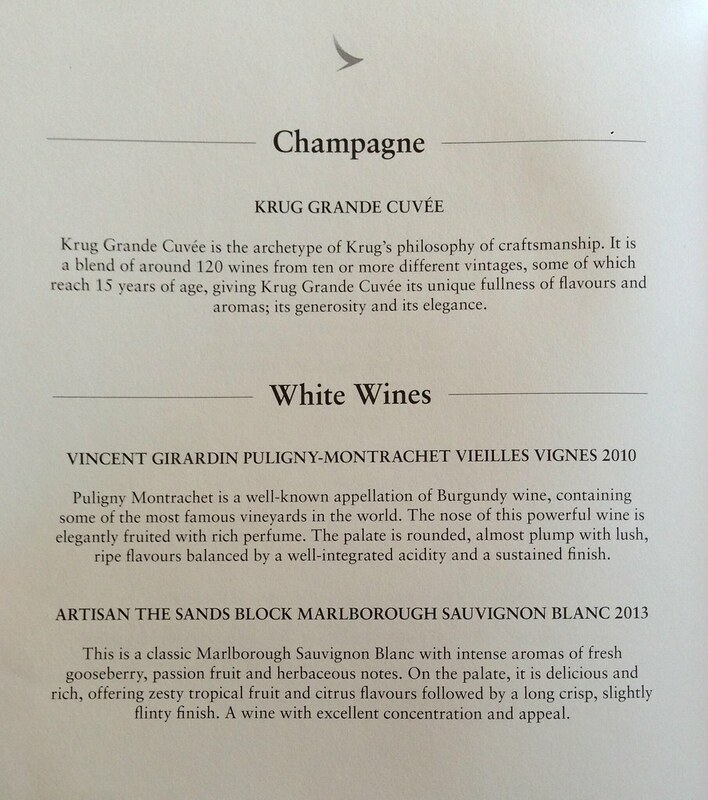 I also had the glass of champagne with caviar as suggested by the menu. 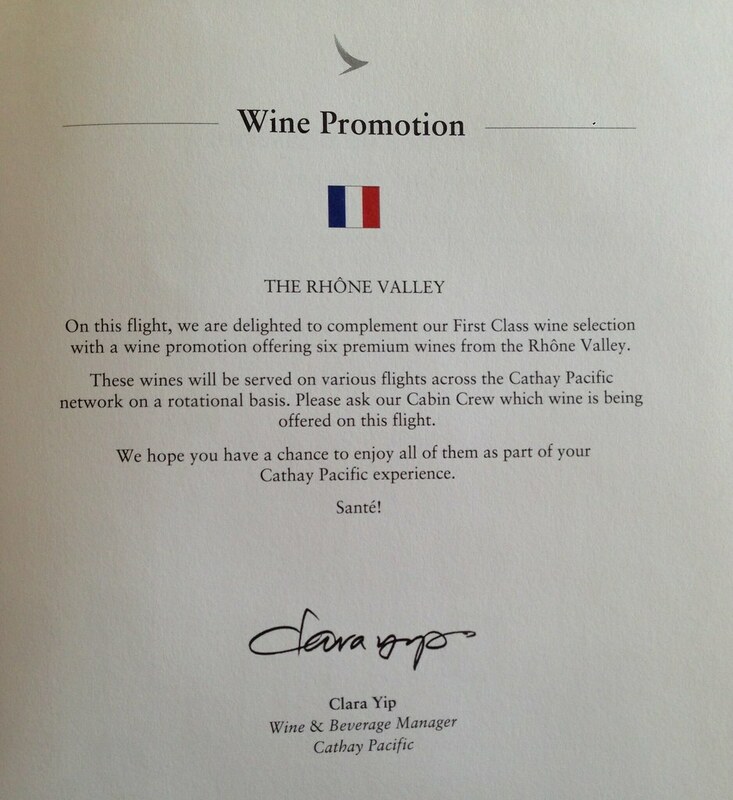 Along with the dishes, there was also a handwritten note from the crew, something that I did not receive the last time I took Cathay Pacific First Class. So it was a redeeming factor of sorts. A bread basket was also placed on the table along with butter for us to enjoy. Next up was the ginseng soup, and it was perfect like my last experience. Chinese soup are probably like my comfort food as I grew up with them and reminds me most of home. 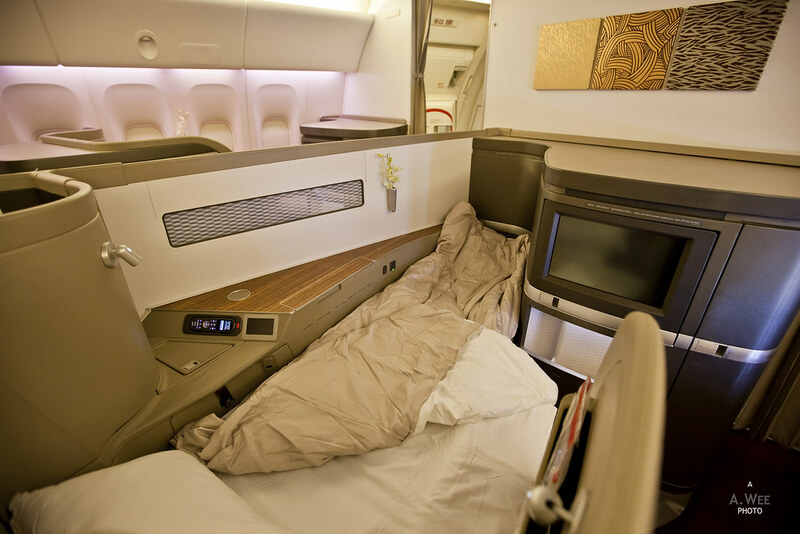 And I think Cathay Pacific does this best. Prawn in the main course a bit too salty though it works well with the freshly cooked white rice. 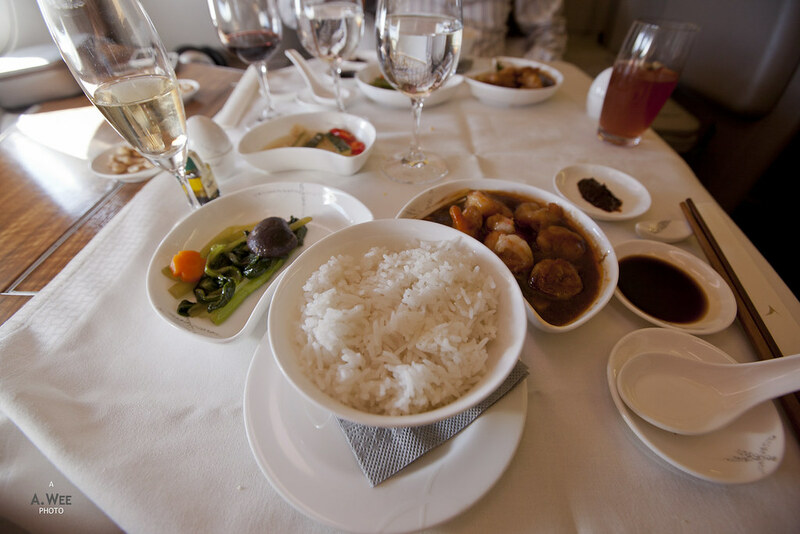 Another specialty of First Class on Cathay Pacific is the rice is cooked with an onboard rice cooker. So no more of those dried up rice beads at the bottom of the casserole. The crew then came around asking us if we would like desserts. We chose one of each, a western dessert of berries and cream since it was summer after all and a chinese dessert of black sesame paste. 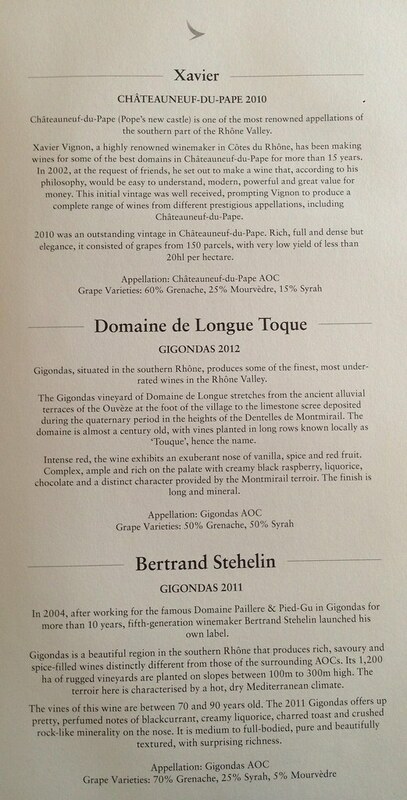 The latter was excellent by the way notwithstanding the unappealing presentation. While waiting for the dessert, Sue came over and asked if she could make the bed on my seat but I asked if she could instead set the bed on both 1 and 2D. 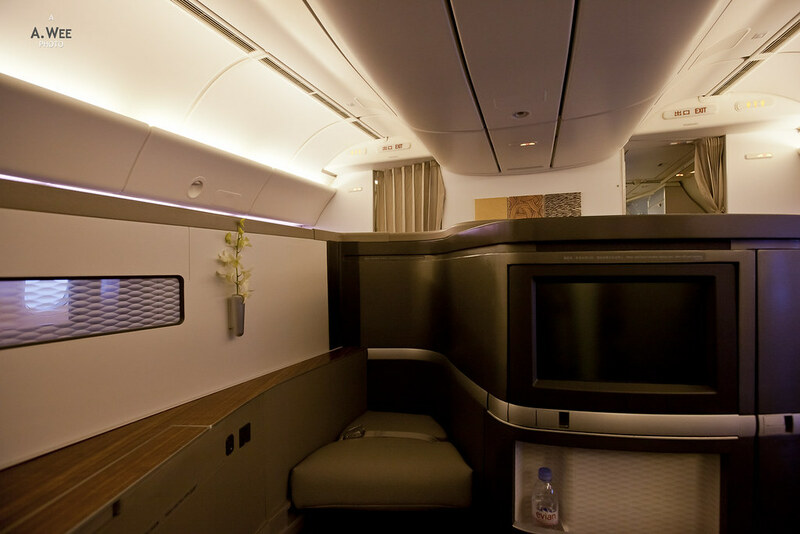 However there was a problem with the seat on 2D, so my bed was set on 2K instead. 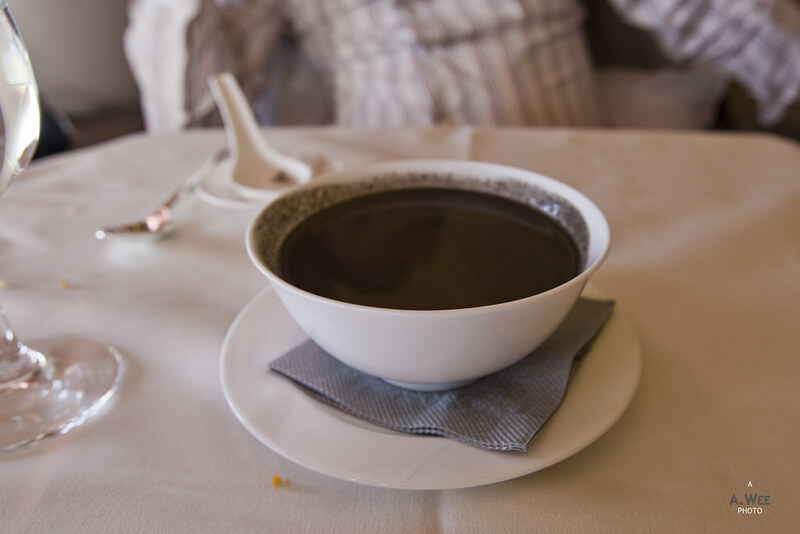 There was a bit of turbulence during meal service though it did not disrupt it that badly and about 3 hours into the flight, which delayed the coffee and tea service as I asked for a cup of cappuccino. The coffee came with truffles that I did not partake in considering how much I already ate. Retreated back to seat 2D to watch a HK movie titled Helios after the meal service. 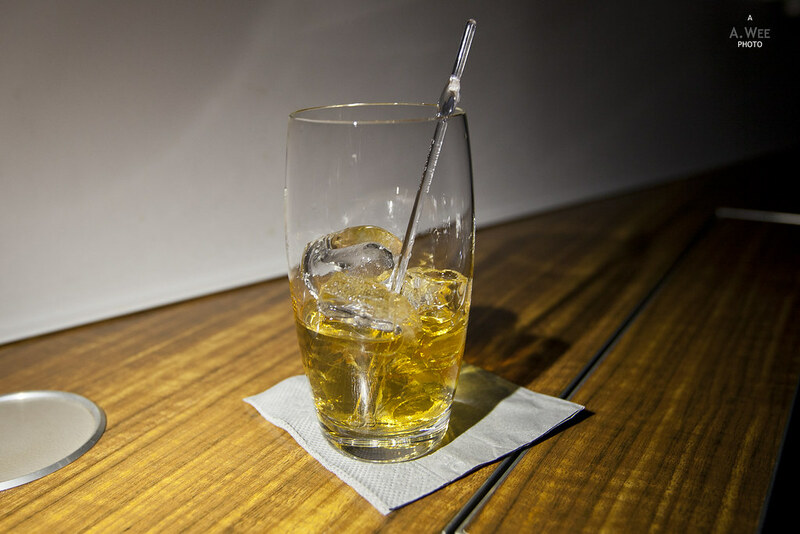 In the meantime, I asked for a cup of Johnnie Walker Blue Label for my dad and myself in order to help me sleep a bit during this daytime flight. After the meal, we also changed into our pyjamas. I have to say I did not miss the Shanghai Tang branding at all as the Pye-branded pyjamas were really comfortable and made of a higher quality material. Probably one of the best airline pyjamas on offer. 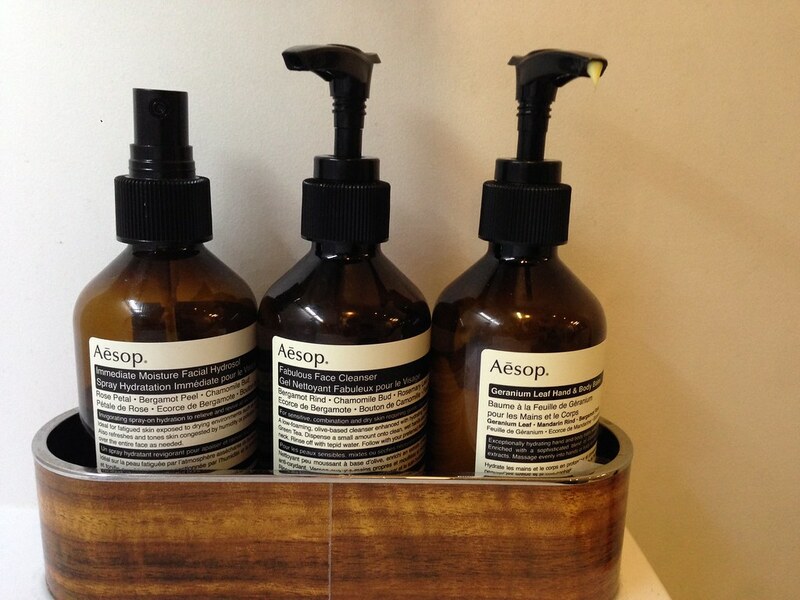 The lavatory itself is also equipped with Aésop amenities. 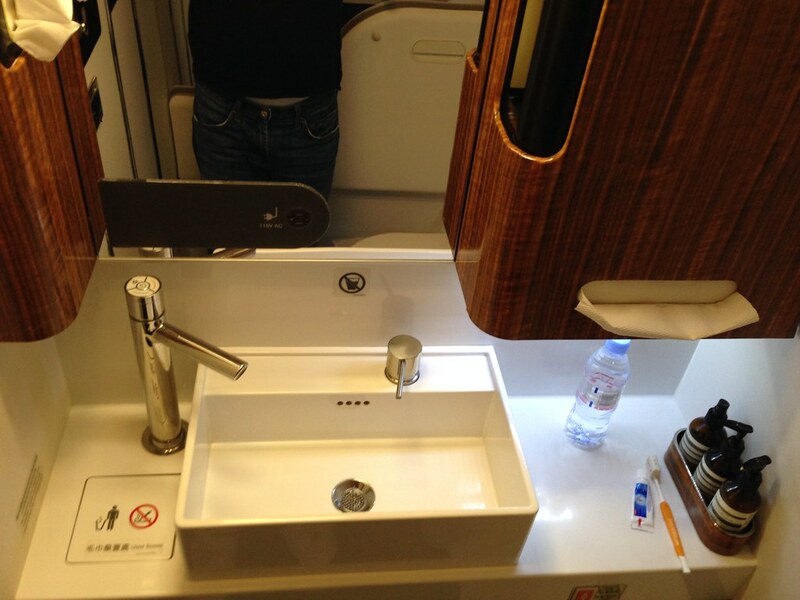 While not as impressive as the lavatories onboard the A380 or the 747, Cathay Pacific also tried to differentiate the lavatories with wood accents and a nicer vanity counter top. It did make it more comfortable for brushing my teeth before I sleep. 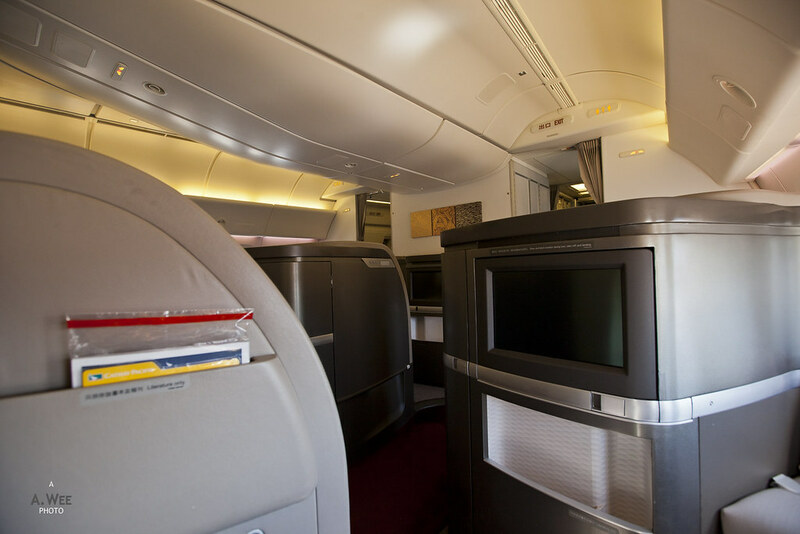 Just before the cabin lights were dimmed, I got around to take some photos of the empty First Class cabin and to just walk around to aid in the digestion of all the food I just consumed! 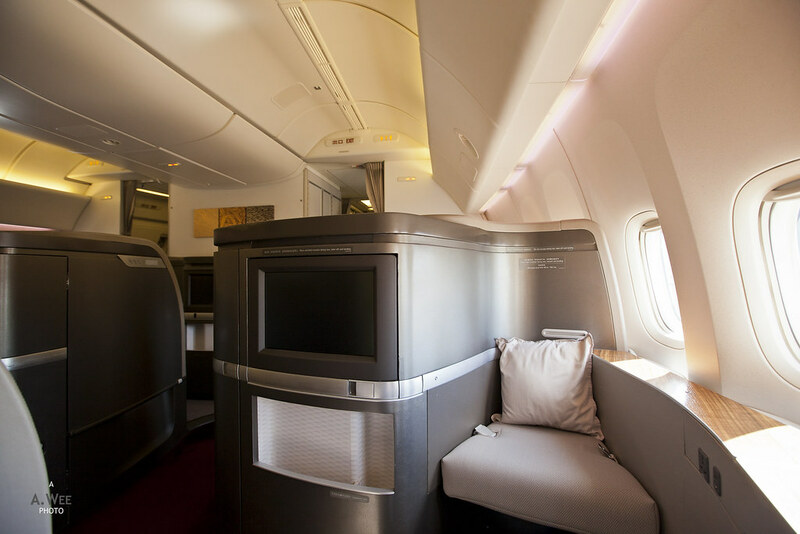 The turndown service on First Class is also another great differentiator with the seat converted to a comfortable bed with plush duvets and pillows. 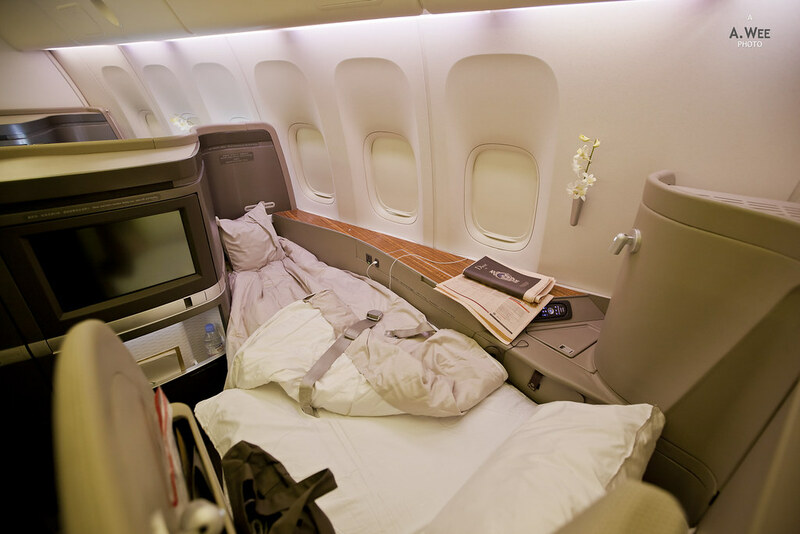 Bottles of evian mineral water was also placed by the bedside with the turndown service. As I got sleepy, I paused the entertainment screen to move over to the bed. 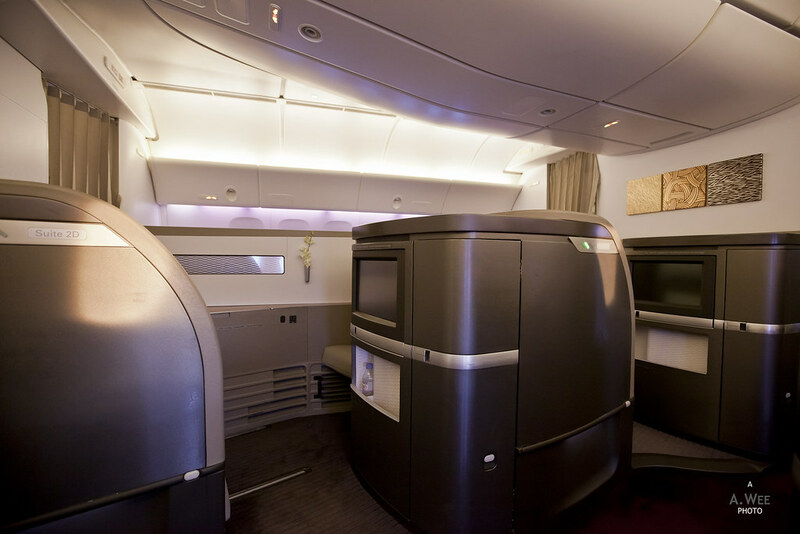 As usual, Asian airlines tend to have a warmer cabin and the daytime flight made it difficult to get a deep sleep. But I did manage a couple hours of shut eye before I just lazed around in the seat. Decided to just call off on the sleep and asked for a snack. At first the other stewardess offered me the chocolates but I was thinking of something savoury and asked if they had any chips. 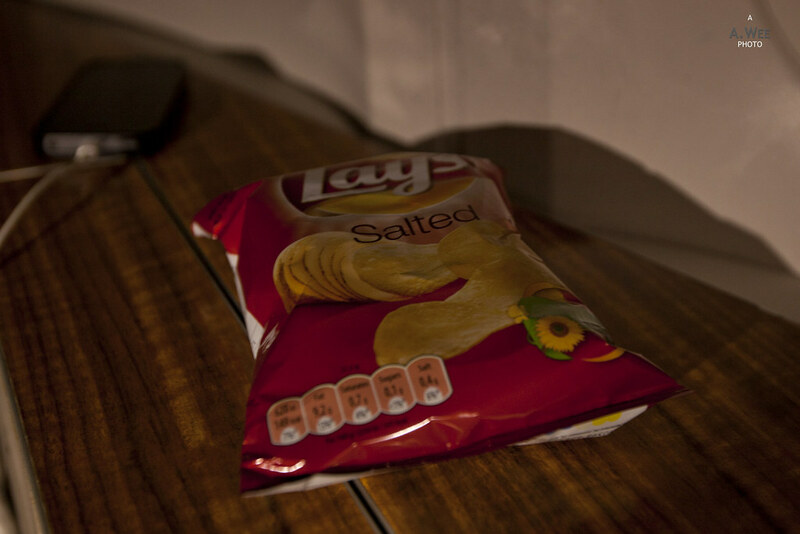 In the end she obtained for me potato chips and chinese tea which I also ordered. It was nice to have the tea brought along with some cookies that I finished as well. As I finished the snacks while watching my inflight movie, I realized I was still a bit hungry. 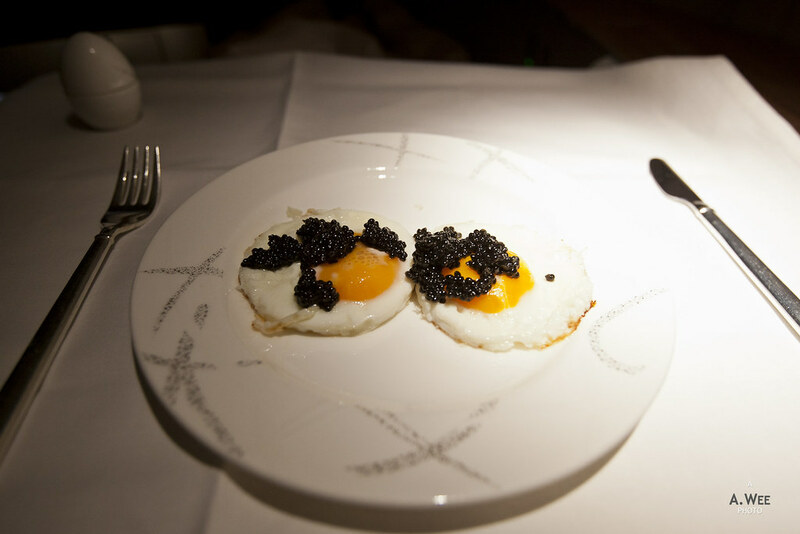 Thus I asked for sunny side up eggs with the leftover caviar. 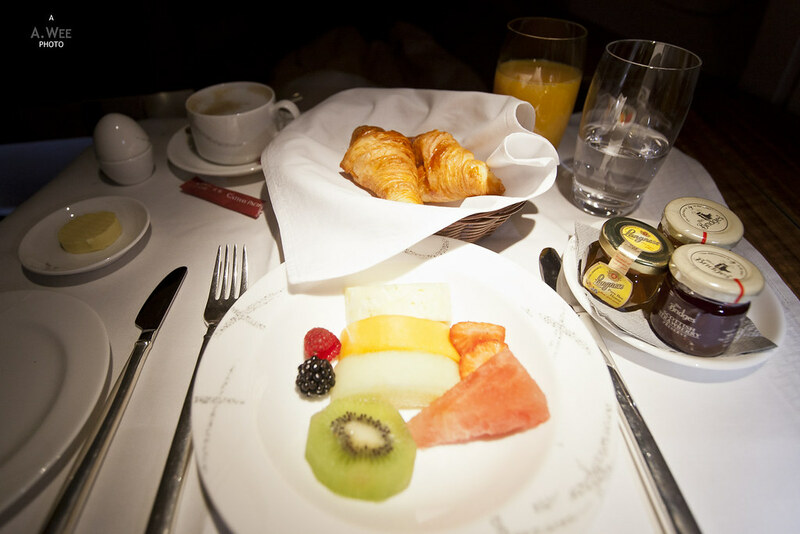 This would be served before my breakfast, and it made for that ultimate inflight snack! As my eggs was served, I realized my dad woke up as he wasn’t able to sleep much either. However he was not feeling hungry yet. With both of us awake, the crew came around to ask him as well for any drinks or snacks. We decided to hold off breakfast till slightly later. About 45 minutes later, the purser came around to prepare our tables for breakfast. This time round we had the meals on our separate seats. 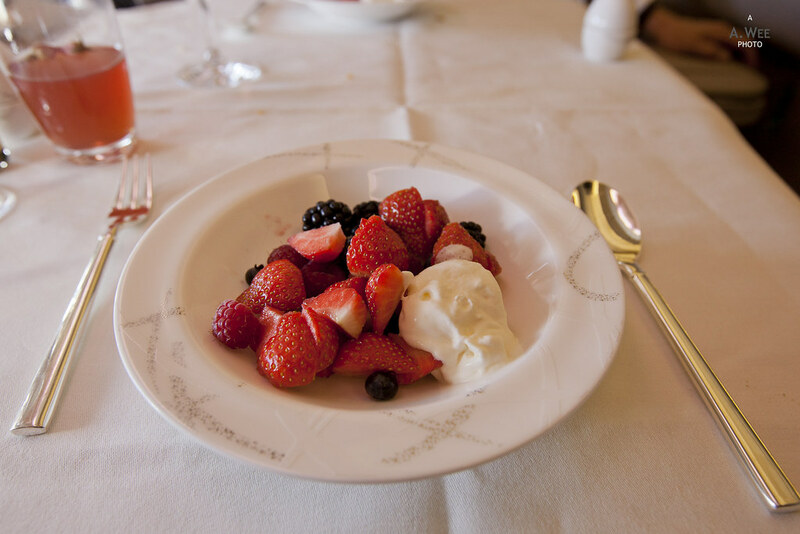 Starting with the fruit plate, I was also offered yogurt and cereal, along with a basket of croissants. 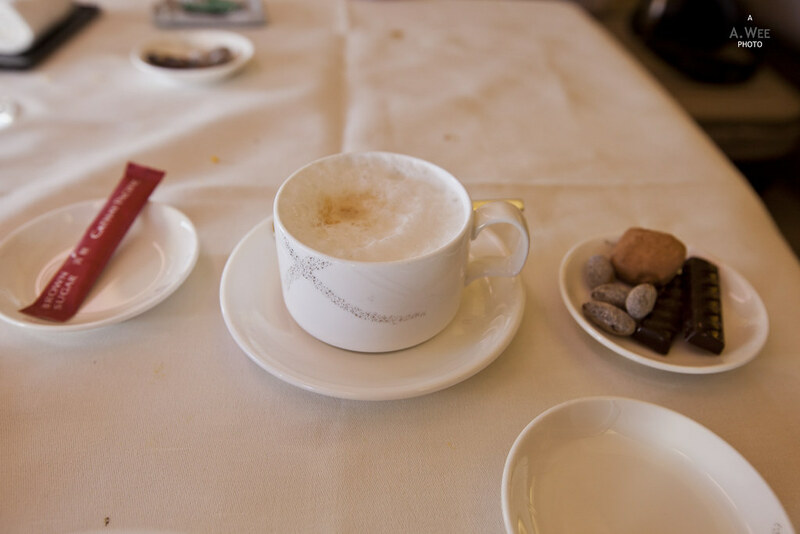 I also requested for another cappuccino with the freshly squeezed orange juice that is unique to First Class. 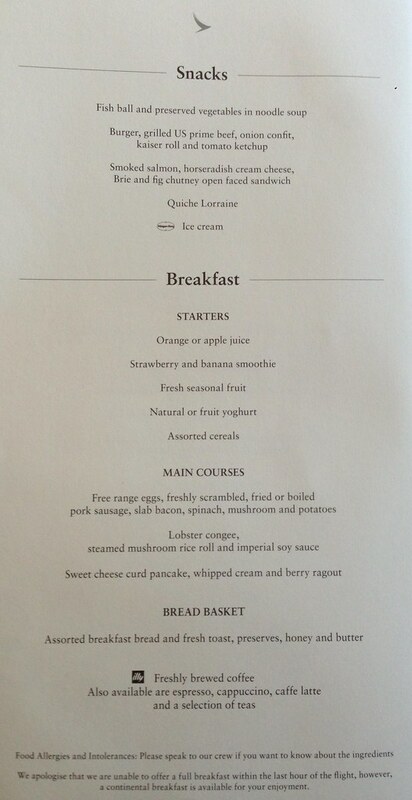 It was also nice of them to provide small bottles of honey and preserves for the croissants. 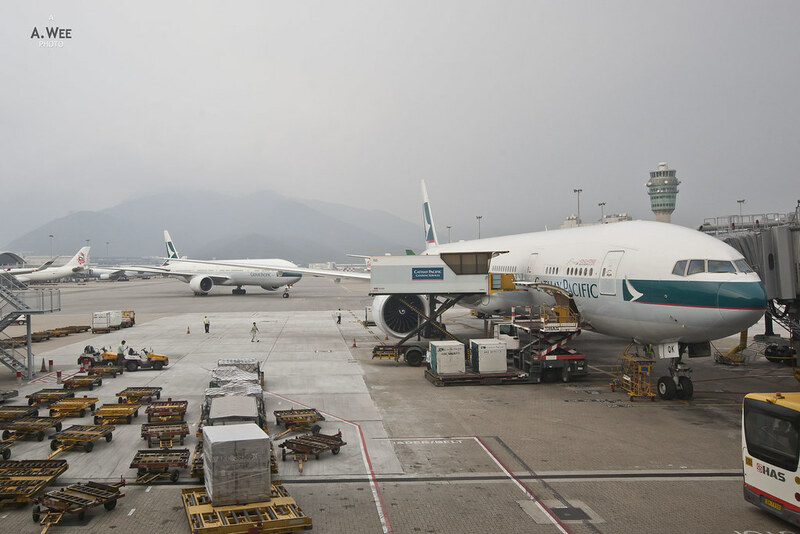 When flying with Cathay Pacific, I actually always look forward to their congee for breakfast. 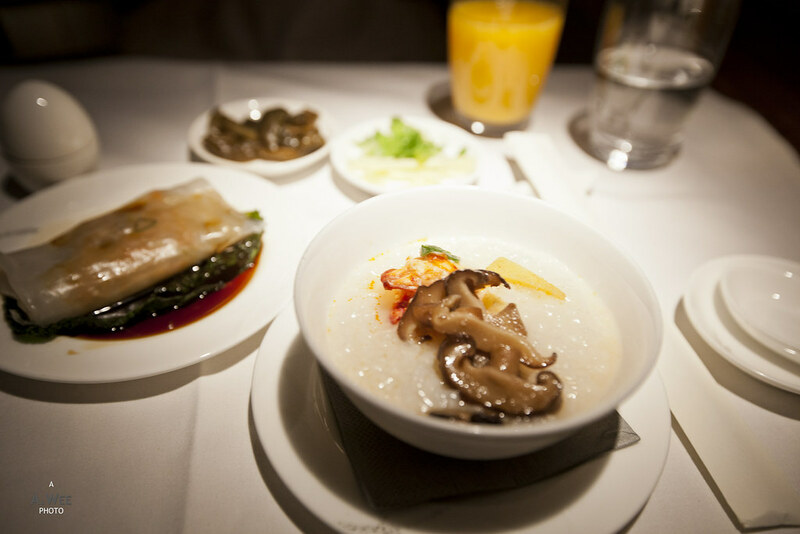 Again it is more like a comfort food for me, and the lobster congee onboard this flight did not disappoint. It also came with a mushroom rice roll that I enjoyed. 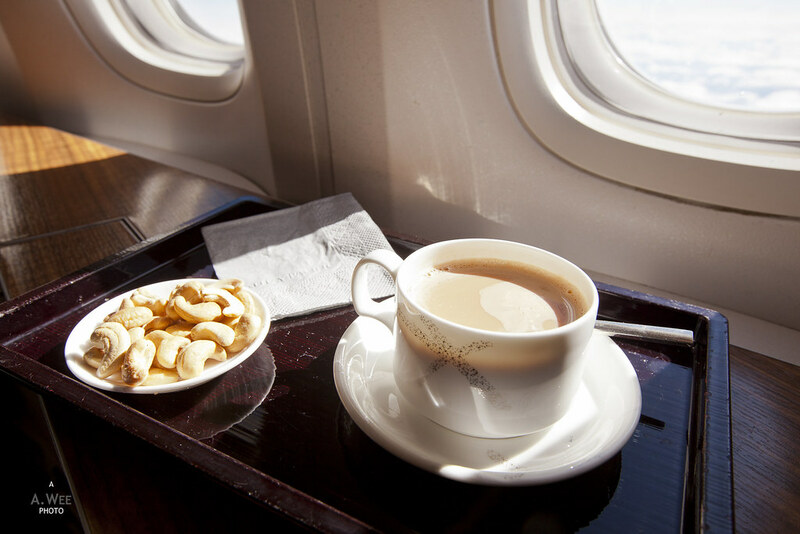 It definitely made for a filling breakfast before landing! Having 2 seats each certainly made it nicer as you get one seat for eating and lounging and another seat for sleeping. 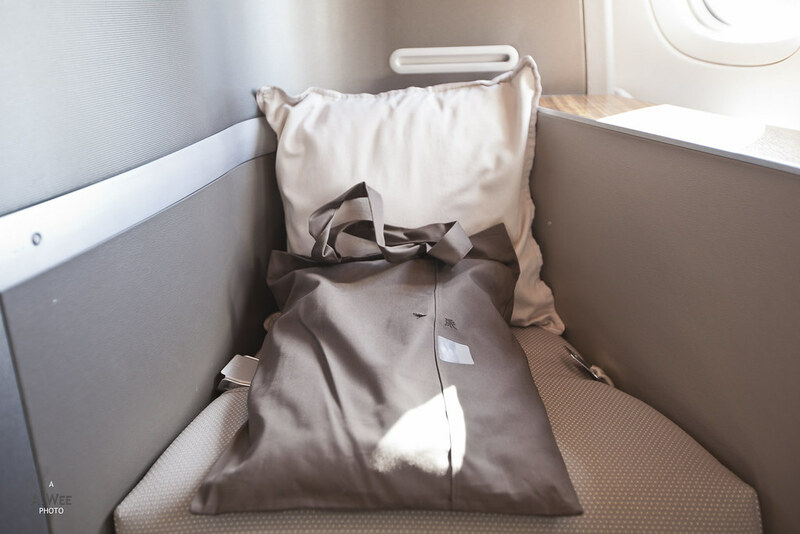 It is worth noting that the cabin crew came around to collect the duvets after passengers wakes up, with the service always prompt and efficient. Breakfast service was a much shorter affair compared to the hours we spent over lunch and with that out of the way, we changed back to our clothes. 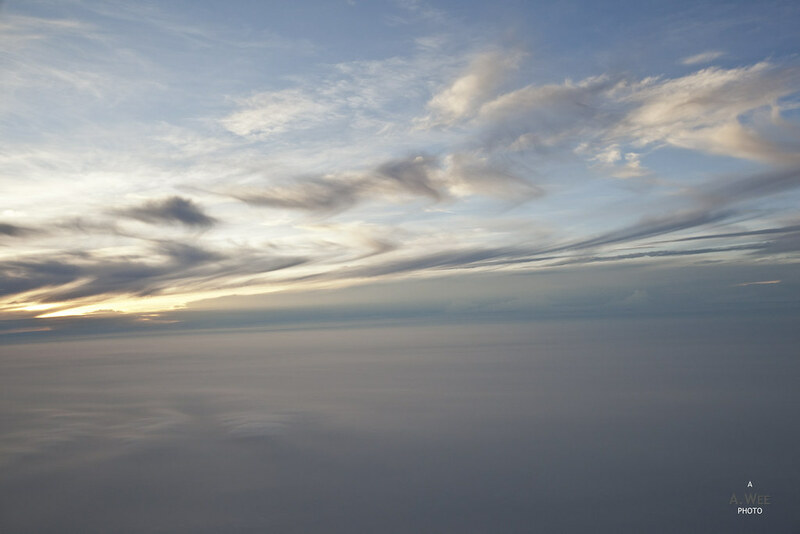 We were greeted with a nice sunrise as we started the descent and the warmth of the sunrise filtering into the cabin certainly perked me up. 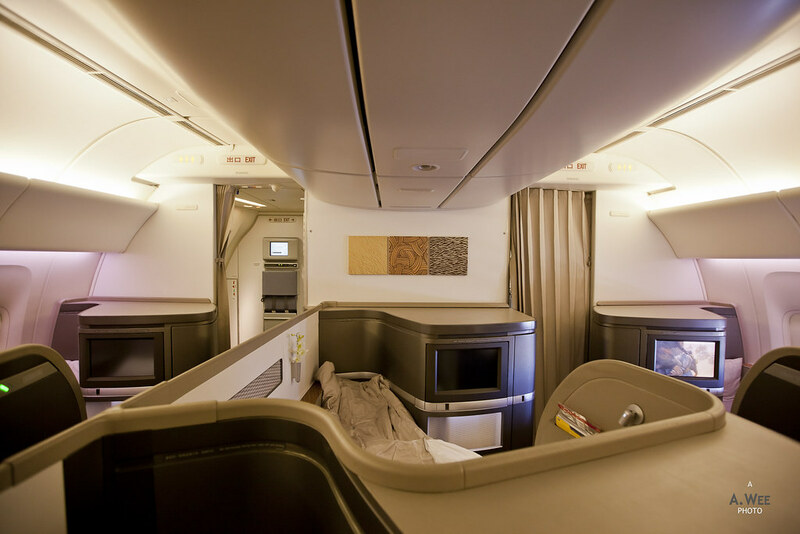 It also accentuates the beauty of the cabin with no overhead compartments making it appear more spacious. 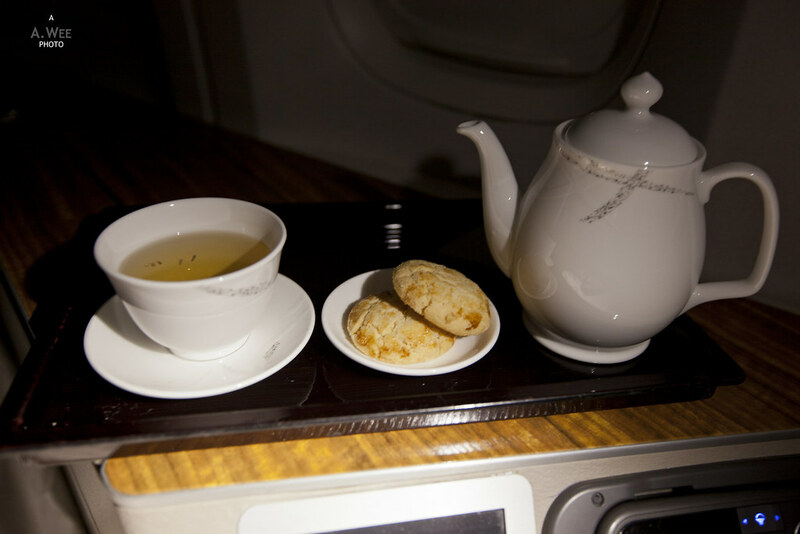 It is all these little details that elevates First Class to another flying experience! However as we descended under the cloud cover, it got a bit dark. 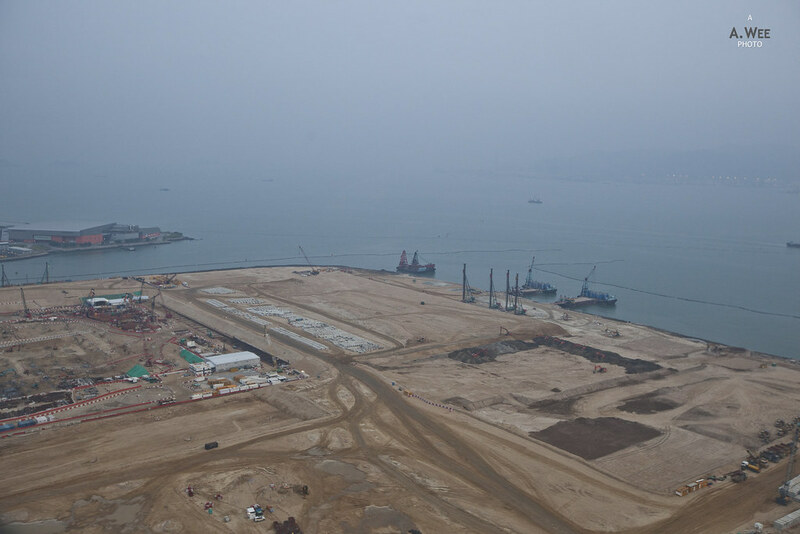 Though with the morning sun, I was able to spot the continuous work on the Hong Kong-Zhuhai-Macau bridge link that is one of the mega projects undertaken in this part of the world. 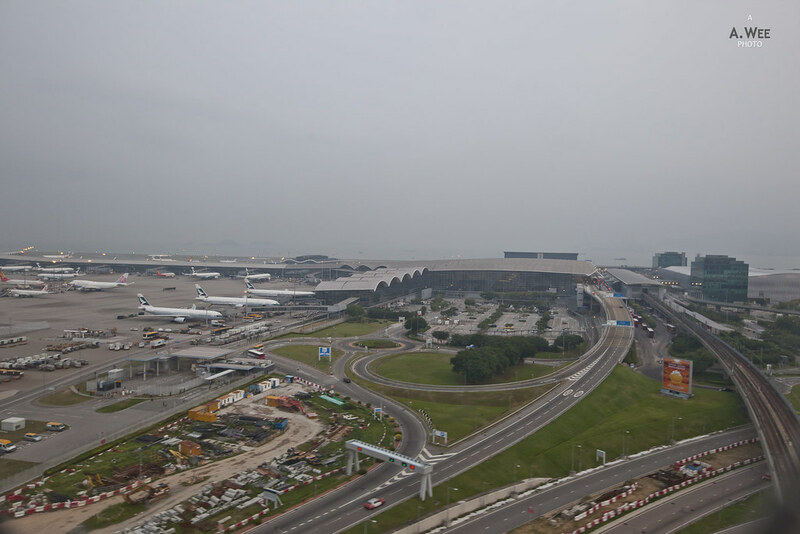 It was also a very nice landing into the airport to conclude another smooth journey onboard Cathay Pacific. We actually landed slightly behind schedule but with a connecting flight later tonight, there was no hurry for us. 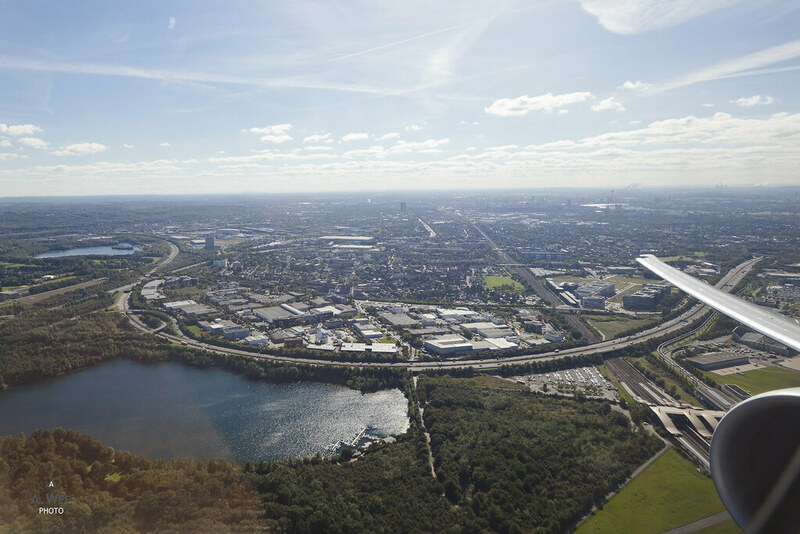 In this particular instance, the front door was opened for disembarkation and with only 2 of us in the cabin, we were the first to exit the airplane. 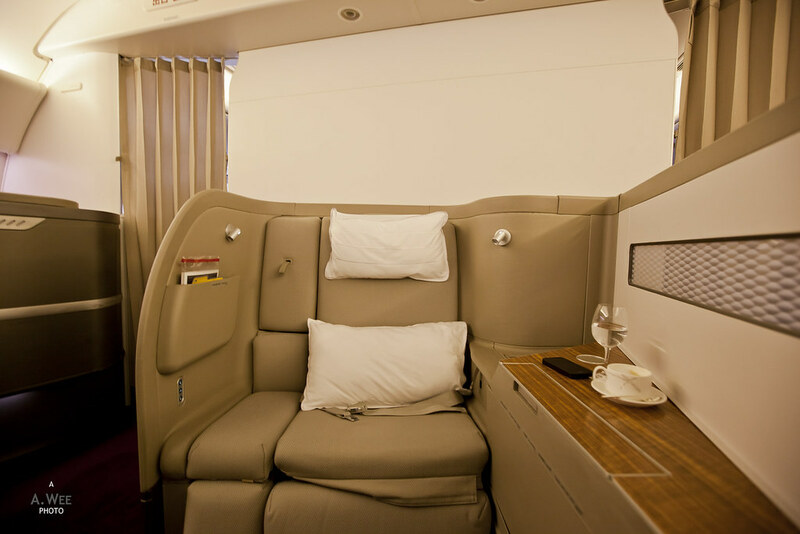 Cathay Pacific might not have the fanciest suites but it does the job well in creating a fantastic First Class experience. 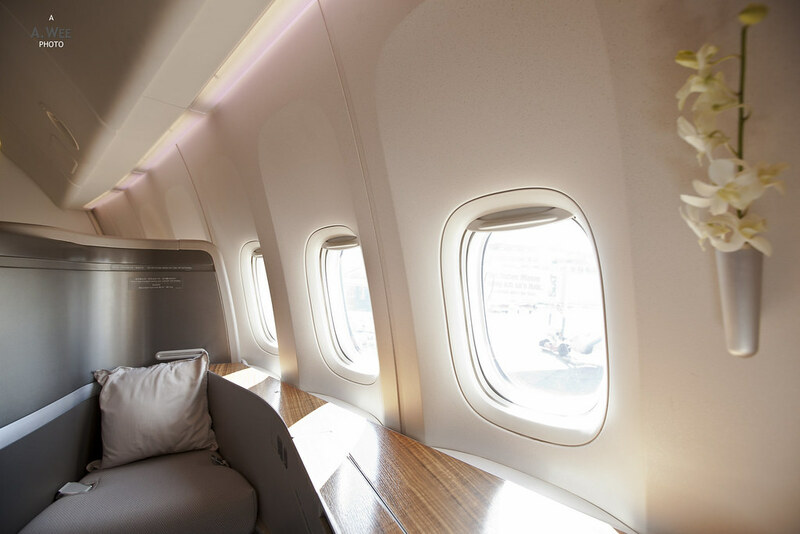 Perhaps it was the company of my Dad that made this flight extra special or maybe it was the empty cabin that elevates it further to a private jet kind of experience. 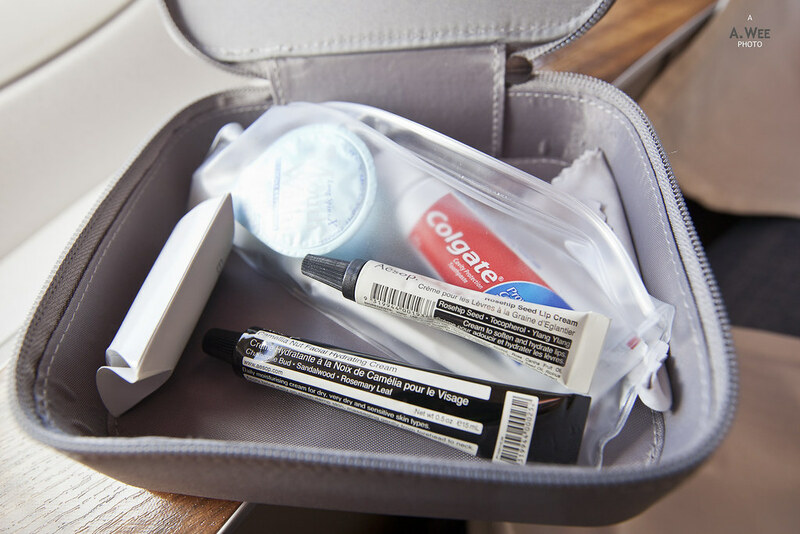 While they might be cutting back elsewhere, the amenities in First Class seems to be upgraded. 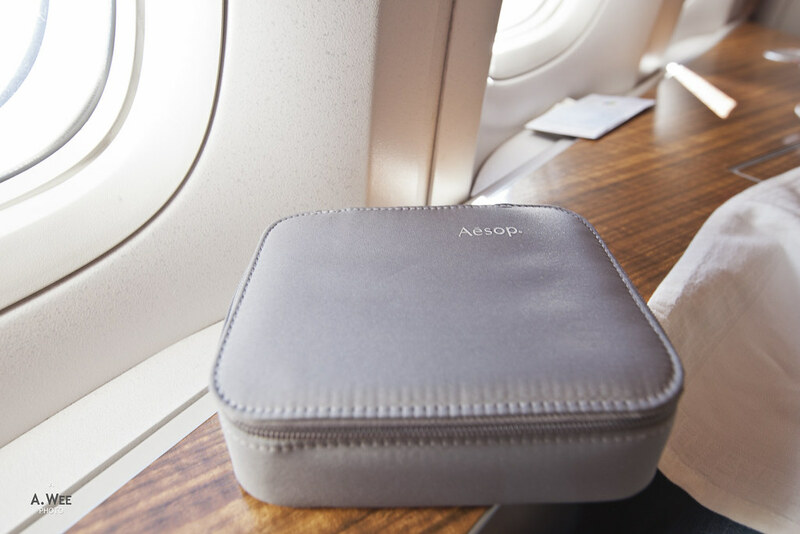 From the Aésop amenities and Pye pyjamas, to the quality Chinese cuisine and the extensive drinks list, I enjoyed this flight even after having experienced more private suite flights onboard ANA and Asiana. 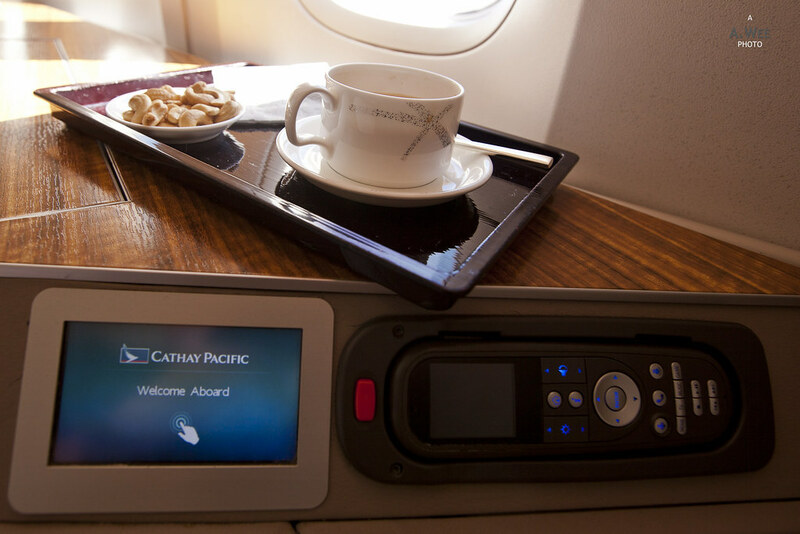 Cathay Pacific is still one of the airlines to fly with up front!